The DREAM Act—a bill to grant legal status to undocumented immigrants brought here as children who complete some college or military service—narrowly went down in defeat in 2010. It passed the House of Representatives but failed by a few votes in the Senate. While federal solutions have been unobtainable so far, many states have pursued their own initiatives on behalf of undocumented students. State-level DREAM Acts, which grant in-state tuition to undocumented residents, have succeeded in 13 states over the past 10 years. Below we review what these states have accomplished as the Senate holds the first-ever hearing on the DREAM Act today led by Sen. Richard Durbin (D-IL) with testimony by leading administration officials including Secretary of Homeland Security Janet Napolitano, Secretary of Education Arne Duncan, and Undersecretary of Defense for Personnel and Readiness Clifford L. Stanley. States are working to make the American Dream possible for undocumented students but they can only do so much. It is time for the federal government to do its part and pass the DREAM Act to provide these students with a legal path to citizenship. Congressional gridlock is making comprehensive reform all but impossible. States, however, are creating their own solutions. Arizona’s strict anti-immigrant bill, S.B. 1070, and its copycats are receiving much attention, but many states are taking a different tack. They are rallying behind their youth by promoting educational opportunities for undocumented students and trying to give them access to a better life. State DREAM Acts recognize a fundamental principle of equality: Children brought to America at a young age, through no fault of their own, deserve a chance at the American Dream. Many of the bills, like the one that passed in Connecticut in May 2011, require that the students live in the state for a significant period of time and attend a high school in the state to be eligible. State legislatures, however, are powerless to confer legal status or citizenship no matter how successful the students are or how long they have lived in the state. Only federal action can fully make the DREAM come true for undocumented youth. The first of these state DREAM Acts appeared, of all places, in Texas, where legislators passed their law in June 2001. The bill, H.B. 1403, authorizes in-state tuition for students who attend high school in Texas for three years prior to graduating or receive a GED in the state. Gov. Rick Perry explained the logic behind the bill in a 2001 address, stating: “We want bright, new Texans to stay here, and contribute great things to our future.” California followed shortly after with its own in-state tuition bill in October 2001. These two states initiated a wave of legislation that spread across the country in recent years. State DREAM Acts now exist in Illinois, Nebraska, New Mexico, New York, Utah, Washington, and Kansas. Connecticut and Maryland both joined the roster in the past two months, with Maryland Gov. Martin O’Malley putting his signature on the bill in early May. Not all states have added their voices to the chorus. Arizona, Georgia, South Carolina, and Indiana have explicitly blocked undocumented students from achieving state residency for tuition purposes. And Alabama’s new, hyper-restrictive immigration law attempts to exclude undocumented students from public universities (and possibly primary and secondary schools) altogether. Still, the trend is overwhelmingly positive. State legislatures recognize that in-state tuition is only a first step, and they are now taking bold new steps to improve the quality of life of undocumented students. In May and June 2011, the California State Assembly passed AB 130 and AB 131, companion bills that would allow students who meet DREAM Act criteria to, respectively, obtain privately funded scholarships and seek state financial aid. This type of legislation would go a long way to helping California’s undocumented youth, with the cost of even in-state tuition a crushing burden. The state Senate is currently considering the bills. States’ broadening of protection for undocumented students reflects the understanding that they are contributing members of the community and will be a big part of the nation’s future. Despite accusations to the contrary, colleges and universities in states with DREAM Acts have not experienced an influx of undocumented students to squeeze out American-born state residents. In fact, they have seen higher revenues as the newly enrolled DREAM students pay tuition. California and all of the DREAM Act states won an additional victory when the state Supreme Court ruled that granting in-state tuition benefits to undocumented immigrants did not violate federal law. The decision bolsters the case for those states considering DREAM Act legislation and it confirms the legitimacy of those states that already made the change. Sadly, not all states still believe all of their residents should have access to higher education. Opponents began a campaign to repeal Maryland’s DREAM Act even as Gov. O’Malley signed it. Perhaps these Maryland petitioners should step back and consider the fate of campaigns against DREAM legislation in Kansas, which passed in-state tuition legislation back in 2004 but failed to repeal it earlier this year. This failure came from the home state of ultra-restrictionist attorney Kris Kobach, currently the state’s secretary of state. In early 2011 the Kansas House of Representatives voted on H.B. 2006, a measure repealing in-state tuition for undocumented students. State Rep. Mario Goico (R-Wichita) gave emotional testimony opposing the vote to repeal, describing his own struggles to pay for his college degree in Kansas. The campaign to repeal the seven-year-old legislation ultimately failed in March. The rejection of repeal efforts in Kansas illustrates the durability of state DREAM Act legislation even in a time of anti-immigrant tensions. State legislatures from California to Connecticut have defended and even augmented laws that make the pursuit of higher education a reality for a greater portion of their residents. We hope other states will follow these examples and extend the right of higher education to a greater number of people. But state-level immigration action can only do so much. Ultimately, it is up to Congress to integrate undocumented youth into the nation. Unlike their federal counterpart, state DREAM laws cannot provide undocumented students with a path to legal status. 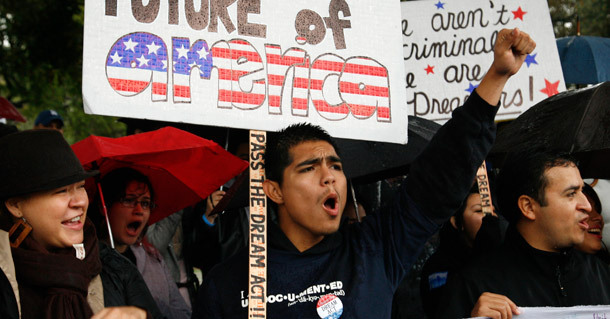 Only Congress—where the DREAM Act was reintroduced by Sens. Richard Durbin (D-IL), Robert Menendez (D-NJ), and Harry Reid (D-NV) along with Reps. Howard Berman (D-CA) and Ileana Ros-Lehtinen (R-FL) on May 11, 2011—can solve the problem. Lawmakers across the nation are striving to improve the lives of undocumented students. The federal government should look to these states, take courage, and pass the DREAM Act. Philip E. Wolgin is an Immigration Policy Analyst and Maya Edelstein is an intern with American Progress.